Buttermilk blender crêpes with leftover Chinese food. It all got started when my eyes opened at 4 or 5 in the morning and Jojo's face appeared before me smiling. Jojo is a local queer punk clothing designer, promoter and general badass with piercing eyes and an angular, symmetrical face, long jet black hair all elbows and knees prowling around like a stray cat. I was passed out on the couch. The couch was were Jojo was staying in between more permanent living arrangements. I poured out the rest of my Bulleit Rye to split between her and I and grabbed her some extra blankets for the couch before crawling into my own bed for a few hours. 9AM and the sun is peeking through my blackout window coverings. It was no use, I had gotten as much time with the sandman as I was going to get that night. I got up, dressed and peeked into the living room, greeted groggily by one eye half open. "I thought we'd have pancakes..."
"Awesome you're the best!" Her time with the sandman had not yet run its course. I put air in my tires and pedaled to the Seals Stadium Safeway (officially, Potrero Center), rolled past the city workers, spare changers, office workers and young parents, locked up and put two shots of espresso in me from Peet's before I attempted anything requiring too much thought. It was a sunny, brisk San Francisco winter day. I was happy to be out of the slush and freezing cold of Cleveland winter and forlorn that I would be going back again soon. Today was about pancakes and records and dancing and cocktails. Today, I decided, I would bust open the package I had received from cousin Sam, who's winters were even colder than Cleveland's. Still the frigid northern winters yield Grade A & B 100% pure maple syrup the next spring. Bixby's Best. The good stuff. Adirondack gold. "Eggs, buttermilk, eggs, buttermilk..." I grabbed a couple of navel oranges, vodka, orange juice, seltzer, bacon and the aforementioned eggs and buttermilk, paid, stuffed them in my carrier bag, got back on my bike and pedaled back up the hill. I snuck past a still sleeping Jojo and got to work, but scanning the pantry I could see that I had made a vital mistake. I looked in the box where we stored overflow dry goods. Panic spread. I checked the freezer and the refrigerator. Nothing. I had forgotten the essential element to instant pancakes: sodium bi-carbonate. Well, I guess Jojo and I would be having crêpes with our diet screwdrivers, disco dancing and mayhem that day. How's it going, blogger.com readers? Chowbacca! subscribers. I've been absent of late. I'm sorry. I miss you too. I've got a lot on my plate (hah! and on a food blog I use this cliché no less! 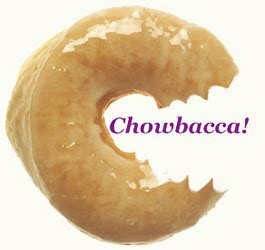 ), so let's all give g0b0t a big round of applause for keeping things afloat here at Chowbacca! 1 1/4 cup of AP flour. 1 1/4 cup of buttermilk or kefir. 1/4 cup of cold seltzer. 2 tsp of kosher salt. 2 tsp of cold unsalted butter. Place all ingredients in a small blender (such as a NutriBullet™), being careful not to exceed the max fill line as I have dangerously done above. Blend for about a minute then let rest for about 5 minutes. Pour batter out in whatever amount you like so there will be a thin coat of batter than you can swirl around in the pan. I am using a 6" non-stick I picked up at the local Cash & Carry, but you can use cast-iron or whatever works best for you. Use a wok, for all I care! It's your life. Over medium-high heat crêpes usually take about one minute for the first side and another 30 seconds or so for the second for lightly browned crêpes. If you are using a NutriBullet you can screw the lid back on and store it in the fridge for a day or two and make crêpes as needed. Serve with ice cream, maple syrup, jam, jelly, salad, shredded meat, peanut butter or if you are really high, all of the above. Pint glass full of ice. Splash of fresh squeezed orange juice.